This IBM® Redbooks® publication will help you to install, tailor, and configure the Open Systems Adapter (OSA) features that are available on IBM zEnterprise® servers. It focuses on the hardware installation and the software definitions that are necessary to provide connectivity to LAN environments. This information will help you with planning and system setup. 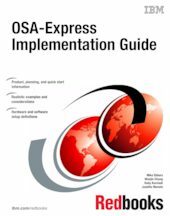 This book also includes helpful utilities and commands for monitoring and managing the OSA features. This information will be helpful to systems engineers, network administrators, and system programmers who plan for and install OSA features. The reader is expected to have a good understanding of IBM System z® hardware, Hardware Configuration Definition (HCD) or the input/output configuration program (IOCP), Open Systems Adapter Support Facility (OSA/SF), Systems Network Architecture/Advanced Peer-to-Peer Networking (SNA/APPN), and TCP/IP protocol.